Charles W. Valentine, 53, of Miltenberger Road, Ridgeley, died yesterday at Baker VA Center, Martinsburg, W. Va., where he was admitted October 13. A native of Ridgeley, he was a son of Jesse F. Valentine, RD 1, Ridgeley, and the late Mary E. (Albright) Valentine. Besides his father, he is survived by two brothers, J. Francis and Marshall F. Valentine, RD 1, Ridgeley. He was a member of the Methodist Church, Knobley Mt. Post 136, American Legion, FOE Aerie 245, and was a veteran of World War II. He was employed by the M.F. Valentine and Son Company. The body is at the George Funeral Home where friends will be received today from 7 until 9 p.m. and tomorrow from 2 until 4 and 7 until 9 p.m. Services will be conducted at the funeral home Saturday at 2 p. m. by Rev. Edward R. VanMetre, pastor of Calvary United Methodist Church. Interment will be in Fort Ashby Cemetery. RIDGELEY, W.Va. - Mrs. Colene Charlotte Valentine, 68, of 100 Knobley Street, died Thursday, April 6, 1989, at her residence. Born June 29, 1920 in Elkins, she was the daughter of the late Jacob and Leslie (Wolfe) Maxson. Mrs. Valentine was a graduate of Allegany High School, Cumberland, Md. She had been employed as a clerk at McCrory’s Store and more recently worked as a sitter for patients in their homes or at area hospitals. At one time she and her husband, Marshall F. Valentine, owned and operated “Valentine’s” in Ridgeley. The business included a restaurant, gas station, and barbershop. Mrs. Valentine was a member of Calvary United Methodist Church and the Ridgeley Senior Citizens. She was a former vice president of the Ridgeley School PTA. Besides her husband, survivors include two sons, David W. Valentine and James D. Valentine, both of Fayetteville, N.C.; two sisters, Wilda Bopp, Cumberland; and Edna Weisenmiller, Ridgeley; four grandchildren, and two great-grandchildren. Friends will be received at the George-Upchurch Funeral Home, Cumberland, on Saturday (today). Services will be conducted there Sunday at 1:30 p.m. by the Rev. John L. Ford. Interment will be in the Fort Ashby Cemetery. J. Fred Valentine, 64, of 1243 Braddock Road, died today in Memorial Hospital where he was admitted January 30. He had been in failing health for several years. Born on Oldtown Road, he was the son of the late Frank and Minnie (Troxell) Valentine. Surviving are his wife, Mrs. Hazel (Lancaster) Valentine; three daughters, Mrs. Geraldine Hendricks, Huntington Wood, Mich.; Mrs. Helen Myers, Baltimore, and Mrs. Janet Church, Oxon Hill, Md. ; one son, John R. Valentine, Mexico Farms; four brothers, Harold Valentine, Fort Lauderdale, Fla.; Lester Valentine, Oldtown Road; Eugene Valentine, Frostburg, and Ernest Valentine, Cumberland, and 11 grandchildren. He was a charter member of the North Branch Volunteer Fire Company and was a retired employe of the Kelly-Springfield Tire Company, having retired in 1964 after 43 years service. The body is at the George Funeral Home where friends will be received today from 7 to 9 p. m. and tomorrow from 2 to 4 and 7 to 9 p.m.
Jesse F. Valentine, 81, of RD 2, Ridgeley, died yesterday at Sacred Heart Hospital, where he had been admitted Saturday. Born in Ridgeley, he was a son of the late Frank and Alice (Martin) Valentine. His first wife, Mary (Albright) Valentine, preceded him in death. Mr. Valentine was owner and operator of the Valentine Motel, Route 28, and was a retired masonry contractor. He was a 60-year member of Bricklayers Local 6, a member of Calvary United Methodist Church, and life member of Ridgeley Rod and Gun Club. Surviving are his widow, May R. (Null) Valentine; two sons, Marshall F. Valentine, Miltenberger Road, and J. Francis Valentine, at home; three stepdaughters, Mrs. Dorothy Carr, Mrs. Joan McClellan and Mrs. Audrey Ault, Cumberland; a stepson, Donald Snyder, Anaheim, Cal. ; two sisters, Mrs. Amanda Mann, Mrs. Alice Thompson, Detroit; two brothers, Benjamin Valentine, RD 1, Ridgeley, and Lawrence Valentine, Johnstown, Pa.; 15 grandchildren and five great-grandchildren. The body is at the George Funeral Home. Services will be conducted Wednesday at 3 p.m. with the Rev. Ronald R. Winterberg officiating. Interment will be in Fort Ashby Cemetery. RIDGELEY, W.Va. - Junior Francis Valentine, 73, of Route 2, Ridgeley, died Monday, July 23, 2001, at the Devlin Manor Nursing Home. Born on Dec. 18, 1927, in Ridgeley, he was the son of the late Jesse F. and Mary Elizabeth (Albright) Valentine. He was also preceded in death by two brothers, Marshall and Charles Valentine. Mr. Valentine served in the U.S. Army during World War II. He was a bricklayer for J.F. Valentine & Sons. Mr. Valentine had been a member of Calvary United Methodist Church. He will be sadly missed by friends, Bonnie Scully and her children, Brandon and Brittney Scully, Keyser. Friends will be received at the Upchurch Funeral Home, Cumberland, Md., on Thursday from 11 a.m. until 1 p.m. The funeral service will be conducted from the funeral home on Thursday at 1 p.m. with the Rev. Oscar Ohler officiating. Interment will be in Fort Ashby Cemetery. Military honors will be accorded by the local combined veterans honor guard. FORT ASHBY, W.Va. — Lewis “Lou” William Valentine, 76, of Fort Ashby, went to be with his Lord on Friday, Aug. 25, 2000. He had been a patient for 31 days at Washington Hospital Center, Washington, D.C. Born on May 22, 1924, he was the son of Robert C. Valentine and Ella M. (Bell) Valentine. He was preceded in death by both parents, two brothers, Robert Valentine and Melvin Valentine; four sisters, Mildred Turner, Myrtle Blair, Florence Valentine and Betty Swann; and his only infant son, Charles Lewis Valentine. He leaves behind his loving wife of 55 years, Virginia L. (Wolford) Valentine, and numerous nieces, nephews, great-nieces and great-nephews. Lou was a father and grandfather figure to many of his nieces and nephews and will especially be missed by nephew Charles W. Kimble and family, Fort Ashby, as well as his niece, Helen Baker, Henderson, Nevada. Mr. Valentine was Methodist by faith and a member of VFW Post #6667, Fort Ashby. He served his country in the U.S. Navy during World War II, on a Destroyer. He was awarded stars for taking part in the Battle of Rabaul, New Britain, Baugainville and Buka and a heavy Japanese air raid. He also received three campaign ribbons, the Asiatic-Pacific, North African and American Theater. He retired after working 35 years for Martin Marietta Aerospace in Baltimore, Md., and Orlando, Fla., as a manufacturing engineer. He enjoyed his retirement years by golfing, hunting and restoring antique cars. He was a member of the Upper Potomac Car Club, Keyser. He bowled on the Thursday night mixed league at White Oaks Bowling Lanes. We love you, Lou, and we will see you in Heaven. Friends and family will be received at the Upchurch Funeral Home, Fort Ashby, on Monday. Services will be conducted at the funeral home on Tuesday at 1 p.m. with the Rev. Paul Mateer officiating. Following the service, military honors will be accorded by the Local Combined Veterans Honor Guard in the funeral home. At. Mr. Valentine’s request, his body will be cremated. Interment will take place in Fort Ashby Cemetery at a later date. RIDGELEY, W.Va. - Marshall F. “Bud” Valentine, 71, of Fayetteville, N.C., formerly of 100 Knobley Road, Ridgeley, died Sunday, June 10, 1990, at his son’s residence in Fayetteville. Born in Ridgeley July 27, 1918, he was the son of the late Jesse and Mary (Albright) Valentine. He was preceded in death by his wife, Colene (Maxson) Valentine, April 6, 1989. Mr. Valentine owned and operated the M&F Valentine & Son Masonry Contractors. He was a lifetime member of the Bricklayers Local 6 and owned and operated Valentine’s Store and gas station. Surviving are two sons, David W. Valentine and James D. Valentine, Fayetteville; four grandchildren and two great-grandchildren. Friends will be received at the George-Upchurch Funeral Home, Cumberland, on Wednesday. Services will be conducted Thursday at 11 a.m. at the funeral home. The Rev. Elmer T. Sprinkle will officiate. Interment will be in the Fort Ashby, W.Va., Cemetery. Pallbearers will be Jim Nestor, Alvin Henry, Jamie Detrick, Leo Carroll, Buddy Hartman, and Paul Poorbaugh. Mrs. Mary Elizabeth Valentine, 69, of RD 1 Ridgeley, died Saturday at her home after an illness of one year. She and her husband, Jesse F. Valentine, operated Valentine's Motel on Route 28. Born in Meyersdale, she was the daughter of James and Emma C. (Braucher) Albright. She was a member of the Methodist Church. Besides her husband, she is survived by three sons, Junior Francis and Charles W. Valentine, at home, and Marshall F. Valentine, RD 1, Ridgeley; a brother, Walter Albright, Meyersdale; two sisters, Misses Clara and Susan Albright, Meyersdale, and four grandchildren. The body is at the George Funeral Home. A service will be conducted there tomorrow at 10 a.m., by Rev. Clyde W. Beard. Interment will be in Fort Ashby Cemetery. Mrs. Mary Jane McVicker Valentine, 86, wife of George P. Valentine, 333 Bedford street, died yesterday. She was a native of Bedlord county, Pa., a daughter of the late James and Amelia Fleegie McVicker. Besides her husband, she is survived by a son, Clarence B. Valentine, this city; two daughters, Mrs Joseph B. Funderburk, Darbin, N C. and Mrs. Edith Robinson, this city, and three grandchildren. The body will remain at Stein's Chapel. Pearl Leota (Slaubaugh) Valentine, 100, Cumberland, died on Tuesday, Nov. 29, 2011, at a nursing home. She was a daughter of the late Somers Slaubaugh and Iva May (Wotring) Slaubaugh. She was also preceded in death by siblings Guy Slaubaugh, Beulah Hardesty, and Grace Giordano, all formerly of the Preston County area. She is survived by one son, Donald James, and one daughter, Betty Tedrow, both of Ohio. Mrs. Marietta (Crowe) Valentine, 71, of 1202 Piedmont Avenue, died yesterday at Memorial Hospital. She had been in failing health the past several years. A native of Mt. 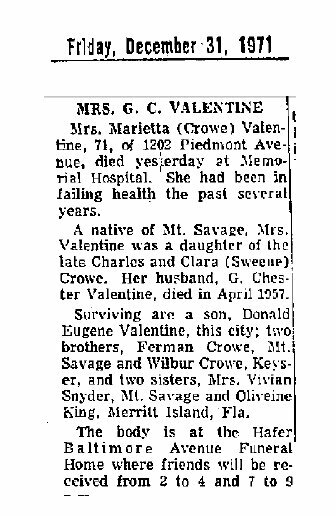 Savage, Mrs. Valentine was a daughter of the late Charles and Clara (Sweene) Crowe. Her husband G. Chester Valentine, died in April 1957[?] Surviving are a son, Donald Eugene Valentine, this city two brothers, Ferman Crowe, Mt. Savage and Wilbur Crowe, Keyser, and two sisters, Mrs. Vivian Snyder, Mt. Savage and Oliveine King, Merritt Island, Fla. The body is at the Hafer Baltimore Avenue Funeral Home where friends will be received from 2 to 4 and 7 to 9. FORT ASHBY, W.Va. — Virginia Lee (Wolford) Valentine, 82, of Fort Ashby, died Wednesday, Nov. 12, 2008 at Heartland of Keyser. Born July 29, 1926 in Fort Ashby, she was the daughter of the late Charles L. and Bertie (Marker) Wolford. She was also preceded in death by her husband, Lewis Valentine; an infant son, Charles Valentine; two brothers, Wayne Wolford and Ray Wolford; and three sisters, Cecil Jones, Kathleen Coffman and Gladys Pownell. Mrs. Valentine was a former employee for the Martin-Marietta Corp., Baltimore, Md. Surviving are a special nephew, with which she lived her last eight years and thought of as a son, Charles “Chuckie” Kimble and wife Becky, Fort Ashby; and a caring niece that she kept in contact with, Helen Baker, Nevada. Virginia, “Aunt Ginny” loved and participated in the lives of her great-nieces, Amie Howell, Charlotte Kimble, Renee Kimble and Joycelyn Kimble, as a grandmother role. She will be sadly missed by all. She is also survived by her two brothers, Clifton H. Wolford, Short Gap, and Edward Wolford, Fort Ashby; one sister, Norma Kimble, Fort Ashby; and many nephews and nieces. At Virginia’s request she will be cremated. There will be no visitation. A graveside service will be conducted Monday, Nov. 17, 2008 at 4:30 p.m. at the Fort Ashby Cemetery with the Rev. Wayne R. Turner officiating. Scarpelli Funeral Home, Cumberland, is in charge of arrangements. Mrs. M. Josephine Vance, 58, of Star Route, Artemas, Pa., died Sunday in Sacred Heart Hospital, where she had been a patient 10 days. Born at Etheridge, Mont., she was a daughter of the late John McKenzie and Nellie (McKenzie) McKenzie. Her husband, Michael Vance, preceded her in death. Mrs. Vance served in the Army during WWII and was a member of SS Peter and Paul Catholic Church. Surviving are two sons, Michael W. Vance and Patrick A. Vance, both of Star Route, Artemas; a brother, Paul McKenzie, Cresaptown, and a sister, Zelma Goldsworthy. Mass of the Christian Burial will be celebrated tomorrow at 10 a.m. at SS Peter and Paul Church. Interment will be in Fairview Cemetery, Englesmith, Pa., where full military honors will be accorded by William McKinley Smith Post 155 American Legion. Mrs. Margaret (Duncan) Vance, 50, of 1204 Union Avenue, Baltimore, died there Sunday. A native of Midlothian, she was the daughter of Alex and Margaret Duncan. Surviving are her husband, Thomas E. Vance; one daughter, Mrs. Virginia Corder, at home; three sons, Edwin, John and Vernon, all at home; one sister, Catherine Miller, of 8153 Cavanaugh Road, Baltimore; two brothers, John J. Duncan, of 8153 Cavanaugh Road, and Donald Duncan, of 18 Bladen Road, Baltimore; two grandchildren and several nieces and nephews. The body is in Witzke Funeral Home, 4101 Edmondson Avenue, Baltimore. A service and burial will take place tomorrow in Baltimore. Michael Vance, 49, Star Route, Artemas, Pa., a longtime employee at the plant was dead on arrival at Sacred Heart Hospital. Mr. Vance was a native of Artemas, and was a son Warren and Julia (Long) Vance, Artemas. He was a veteran of WWII. Also surviving are his widow, Josephine (McKenzie) Vance; two sons, Michael W. and Patrick A. Vance, both at home; two brothers, Ray Vance, Artemas, and Guy Vance, West Hyattsville, and a sister, Miss Mabel Vance, Artemas. Services will be conducted Thursday at 3 p.m. in the Fairview Christian Church, Inglesmith, Pa. by Rev. Charles Perrin and Rev. ray Mallow. Interment will be in the church cemetery. Artemas American Legion members will conduct military rites at the gravesite. Edgar DeWain Vandegrift, 51-year-old president of the John I. Vandegrift Company, local contracting firm, died this morning in Memorial Hospital where he had been a patient about two weeks. He had been in failing health some time. A graduate of Carnegie Institute of Technology, Pittsburgh, Mr. Vandegrift became associated with the contracting firm his father founded after working a brief time with the City Engineering Department. He succeeded his father to the presidency of the business, which carries his name. Active in fraternal organizations, Mr. Vandegrift held membership in the Masonic Order, Shrine, Engineers Club, Cumberland Lodge 63 BPO Elks, and was a past president of Lions Club. He was also affiliated with the Chamber of Commerce and was chairman of that group's Industrial Promotion Committee which was instrumental in locating the Pittsburgh Plate Glass Company's plant here. Mr. Vandegrift was a member of the board of directors of the Liberty Trust Company and also a director of the Cumberland Country Club. He also retained membership in First Baptist Church. Born in Ridgeley, he was a son of Mrs. Frances (Martin) Vandegrift, The Dingle, and the late Mr. Vandegrift. Surviving, besides his mother are his widow, Mrs. Helen (Reitz) Vandegrift, Bedford Road; three brothers, William A. Vandegrift, Hyattsville, and John F. Vandegrift and Carl S. Vandegrift, secretary-treasurer of the contracting firm, both of this city, and two sisters Mrs. Edwin Fleming, Annapolis, and Mrs. Galen E. Storer, this city. The body will remain at the Stein Funeral Home. The family requests flowers be omitted and donations sent to the Damon Runyon Cancer Fund for research. Mrs. Frances Athey Vandegrift, 79, of 505 Beall Street, died this morning at Sacred Heart Hospital. She was the widow of John I. Vandegrift, founder and president for many years of the local contruction company, the John I. Vandegrift Company. Mrs. Vandegrift was a member of Cumberland Chapter 56, Order of Eastern Star, and First Baptist Church. She was born in West Virginia on December 19, 1883, the daughter of the late William A. and Victoria (Marker) Martin. She is survived by three sons, William A. Vandegrift, Hyattsville; John F. Vandegrift, and Carl S. Vandegrift, both of this city; two daughters, Mrs. Mildred V. Storer, this city, and Mrs. H. Edwin Fleming, Penfield, N. Y.; two sisters, Mrs. Cora Runkle and Mrs. Elizabeth Moreland, both of here, and seven grandchildren. The body is at the Stein Funeral Home where services will be conducted Monday at 2 p. m. by Rev. Randolph Keefe, pastor of Grace Baptist Church. Interment will be in Rose Hill Cemetery. Cumberland Chapter OES will conduct services Sunday at 7:30 p. m. Friends will be received at the funeral home from 2 to 4 p. m. and 7 to 9 p. m. tomorrow and Sunday. WESTERNPORT, Md -- Gladys B. Vandergrift, 71, of 508 Maryland Ave. in Westernport, formerly of Bloomington, Md., died Thursday, Aug. 30, 2001 at Sacred Heart Hospital in Cumberland, Md. Born in Beryl on Nov. 11, 1929, she was the daughter of the late Isaac and Maggie (Warnick) Smith. Her husband, John F. Vandergrift, in 1964 also preceded her in death. She was the last survivor of her immediate family. Vandergrift was a former employee of the Candlewyck Inn in Keyser. She was a member of the Bloomington Fire Co. Ladies Auxiliary. Surviving are her children, Richard Vandergrift and his wife, Beth, of Brighton, Tenn., Robin Vandergrift of Piedmont, Janet Riley and her husband, Terry, of Rawlings, Md., Robert Vandergrift and his wife, Sueme, of Bunker Hill and James Vandergrift and his wife, Tammie, of Westernport and ten grandchildren, Joey Vandergrift, Misty Riley, Jennifer Riley, Denise Wilt, Brittany Riley, Courtney Vandergrift, Keiley Vandergrift, Matthew Vandergrift, Tiffany Vandergrift and James Vandergrift II. The family will receive friends at the Boal Funeral Home in Westernport from 2 to 4 and 7 to 9 p.m. Saturday. Services will be conducted at the funeral home at 2 p.m. Sunday, with the Rev. Donald Nelson officiating. Interment will be at Philos Cemetery in Westernport. RAWLINGS - Norval William Vandervort, 79, of Route 3, Rawlings, died Wednesday, Feb. 6, 1991, at Sacred Heart Hospital, Cumberland. Born Oct. 11, 1911, in Morgantown, W. Va., he was a son of the late Luther and Lizzy (Vandervort) Vandervort. Mr. Vandervort was a retired employee of the Celanese Corporation where he worked for 44 years. He was a member of the Daville Community Church, the Keyser Full Gospel Businessmen and was an Allegany County foster parent. He is survived by his widow, Jessie (Shaffer) Vandervort. Also surviving are two daughters, Wilma Jenkins, Martinsburg, W. Va.; Nancy Reed, Danville; two adopted daughters, Kathleen Vandervort, Cumberland; Jennifer Vandervort, at home; two foster sons, George Zufall, Cresaptown; Loudon Baker, Bowling Green; two foster daugthers, Mary Emmart, Danville; Mary Albright, Cumberland; one borther, Paul Vandervort, Baltimore; one sister, Nellie Judy, Morgantown; four grandchildren, two great grand children, nine foster grandchildren, one foster great grandchild. Friends will be received at the Rotruck funeral Home, Keyser, W. Va., on Friday from 2 to 4 and 7 to 9 p.m. where services will be conducted at 1 p.m. Saturday by the Rev. Waco Biser, the Rev. Robert Nair and the Rev. John Footen. Interment will follow in Sunset Memorial Park, Cumberland. Source: The Cumberland Times-News; Cumberland, Maryland; Feb. 1991. First Editor of the Tribune Dies at his Home in Missouri Confederate soldier, Editor and Statesman. A Native of Mineral County and its First Editor. Hon Charles H Vandiver, died at his home in Higginsville Mo, last week, of paralysis, aged 72 years. Mr Vandiver was a native of Mineral County, a son of Archibald Vandiver, who owned a large plantation on Pattersons Creek near Burlington. He is survived by two brothers, J L of Virginia, and George of Missouri, his two sisters, Mary and Fannie, married Holland and Peyton Tabb. He had many relatives in Mineral and adjoining counties. He was a member of Stonewall Jackson's Staff during the Civil War, and was one of the bravest soldiers in the Confederacy, and lost his right arm in battle. After the close of the war, Mr Vandiver studied law and located in Keyser, in 1870 he founded The Keyser Tribune, was its first editor and proprietor. The Tribune was then the only newspaper in Mineral County. In the eighties Mr Vandiver moved to Missouri, where he was very successful in business and prominent in politics, and was three times elected a member of the State Senate. He frequently contributed articles to the Tribune over the signature of "X O X", which meant "Ex-Our Selves." He was very popular in Keyser and adjoining country. He had a bright mind and was possessed of a jovial disposition and a past master in relating anecdotes and telling jokes, and could hold a crowd and keep them in laughter for hours. He was an expert horseman and very fond of the chase. From young manhood he was an active member of the Presbyterian church. Mr Vandiver never married. Later information, from Higginsville Mo, informs us that Hon C H Vandiver died Sept 7th and that he had a stroke of paralysis six weeks before his death. He was buried in a Confederate uniform. Below we give a clipping from the editorial page of the "Higginsville Jeffersonian" a paper published in the town in which he lived and died. He looked like a king as he lay there dead. The kindness which had always lighted his fine face was still upon it, and only ennobled and glorified by death. Benign peace and glad tranquility had been his as he crossed the border, and in death he looked as one who dreams a beautiful dream. There is no virtue more lovable than kindness, and Major Vandiver was the kindest of men. His relatives and close friends knew him as one who exemplified the truth that the bravest are the tenderest. And both here and in Excelsior Springs his tenants found him an indulgent and considerate landlord. In war he proved himself a heroic soldier and in peace a good and useful citizen. And he was a man who prospered without ever becoming grasping or ungenerous. Such men make life worth living for us all. The subject of this sketch was born near Burlington on Patterson's Creek, May 1, 1840. He was one of seven children, born to the union of Archibald and Rebecca Vandiver, all of whom, save Mrs Mary Tabb, and her brother, George, of LaFayette Co, Missouri, have passed over the mystic river of death. On Saturday, September 9, the funeral obsequies were conducted from the Presbyterian church, of Higginsville, of which for years he had been an honored elder; his death having occurred on Thursday afternoon preceding. From the local papers we infer that the grim monster seldom casts a deeper sorrow over a community than that which fell upon the citizens of Higginsville in the passing of this princely man. The occasion was rendered the more impressive by the endearing friendship which existed between the deceased, and the venerable Judge Ryland, the minister who had charge of the services. He was my friend and from him my life has received an inspiration. When a boy away from home and having but little knowledge of the world, he spoke kindly and tenderly to me regarding my religious conditions. While I pen these lines the tear involuntarily flows down my cheek. He was a brave soldier and in time of peace a useful citizen. He served the state of his adoption in the senate and his record was untarnished. He accumulated property without being grasping. It was said of him that he was an indulgent landlord. In his relation to his God as a Christian he was faithful and has doubtless received the reward of his righteous. The founding of the Tribune which is now one of the best county papers I know of, and which is doing so much in promoting the principles of the great apostle of human liberty, Thomas Jefferson, and its successful publications after the prostration incident to the Civil War is a fit memorial of this imperial man. HARDY COUNTY NEWS, Moorefield Examiner of 7th - Miss Cornelia VanMeter died at the home of J. Wm. Gilkeson, last Saturday evening about 5 o'clock over a period of many months. She had been a great sufferer and some time ago was taken to Baltimore for an operation in hopes that her life might be prolonged, but the operation was not performed and she was brought home to be with her loved ones in her last days. On Monday evening funeral services were held at the home of Mr. Gilkeson, conducted by Rev. F. J. Brook, of Romney, after which her remains were laid to rest in Olivet Cemetery. Mrs. Eleanor VanMeter, 77, of 15 Mineral Street, Ridgeley, died today in Memorial Hospital. A native of Dawson, she was a daughter fo the late John and Mary (Lease) Waxler. Her husband, G. Vernon VanMeter, preceded her in death. Mrs. VanMeter was a member of the Calvary United Methodist Church. Surviving are four daughters, Mrs. Clara Teets, Maywood, Ill.; Mrs. Mary Brehm, Aliquippa, Pa.; Mrs. Lucy Fisher, Wenonah, N. J., and Mrs. Wilda Sine, Fairview, W. Va.; two sons, Alvin VanMeter, at home and James VanMeter, Bethany, W. VA.; 22 grandchildren and 20 great-grandchildren. Friends will be received at the George Funeral Home from 7 to 9 p.m. today and tomorrow from 2 to 4 and 7 to 9 p.m. SOURCE: The Cumberland Evening Times; Cumberland, Maryland; Feb. 6, 1975; page 14. George V. VanMeter, 70, of 15 Mineral Street, Ridgeley, was dead on arrival yesterday at Sacred Heart Hospital. Born at Dawson, he was a son of the late Isaac L. and Hannah M. (McKenzie) VanMeter. Mr. VanMeter was a retired employe of the Kelly-Springfield Tire Company and held membership in Ridgeley Rod and Gun Club and the Methodist Church. Surviving are his widow, Mrs. Eleanor M. (Waxler) VanMeter; two sons, A. Lee VanMeter, Ridgeley, and James V. VanMeter, Bethany, W. Va.; four daughters, Mrs. Clara S. Teets, Chicago; Mrs. Jean M. Brehm, Aliquippa, Pa.; Mrs. Lucy M. Fisher, Philadelphia, and Mrs. Wilda S. Sine, Fairview, W. Va.; two brothers, Stanley M. VanMeter, Carpenter's Addition, and J. Wilbur VanMeter, this city; three sisters, Mrs. Grace Williamson, Keyser; Mrs. Edith Swarner, Ridgeley, and Mrs. Bessie Ross, Midland; 20 grandchildren and nine great-grandchildren. The body is at the George Funeral Home where friends will be received today from 2 to 4 and 7 to 9 p.m. A service will be conducted at the funeral home tomorrow at 1 p. m. in charge of Rev. Edward R. Van Metre, pastor of Calvary United Methodist Church. Interment will be in Sunset Memorial Park. Grover C. VanMeter, 66, of South Centre Street, died yesterday at Sacred Heart Hospital where he had been a patient 10 days. He had been in ill health several years. Mr. VanMeter was a native of West Virginia, but had resided in Cumberland most of his life. Surviving are his widow, Leah Grace (Welter) VanMeter; two sons, Richard and Charles VanMeter, both of Baltimore; three daughters, Miss Dorothy Vanmeter, Baltimore; Mrs. Roma Hayward, Los Angeles, Calif., and Mrs. R. J. Reed, Potomac Park; four brothers, J. H. VanMeter, Luke; J. W. Porter, (sic) this city, and Stanley and Vernon VanMeter, both of Ridgeley; three sisters, Mrs. Edith Swaner, Ridgeley; Mrs. A. S. Ross, Midland, and Mrs. Grace Williamson, Keyser; nine stepchildren and eight grandchildren. The body is at the Kight Funeral Home where the family will receive friends from 2 to 4 p. m. and 7 to 9 p. m. Services will be conducted at the funeral home on Thursday at 2 p. m. by Rev. Jacob H. Snyder, pastor of Kingsley Methodist Church. Interment will be in Mt. Herman Cemetery. Mrs. Hannah Margaret VanMeter, 80, died last night at the home of a daughter, Mrs. J. R. Swaner, 148 Main street, Ridgeley, W. Va., after a lingering illness. A native of Keyser, W Va., she was a daughter of the late William and Margaret McKenzie. Her brother, George W. McKenzie, Cresaptown, died last month. She was a member of the Methodist Church. Surviving are her husband, Isaac L. VanMeter; six sons, J. Herbert, Luke; William, Connellsville; Cleveland, Cumberland; Vernon, Stanley M., and Wilbur, all of Ridgeley; four daughters, Mrs. Maude Ravenscroft, and Mrs. Grace Williamson, both of Keyser; Mrs. Lucy Yonker, Denver, Colo.; Mrs. Bessie Ross, Lonaconing; 58 grandchildren and 38 great-grandchildren. Moorefield, W. Va., May 28 - Harry Cunningham VanMeter, 84, died Friday in Herndon, Va. A son of the late Joseph and Theresa Cox VanMeter, his young manhood was spent in Moorefield and on his father’s farm, “Riverside,” which afterwards became the home of the late John W. McNeill, Sr., who passed away the day after Mr. VanMeter. His wife, Sarah Cary White, daughter of the late Rev. Dr. Geo. W. White, pastor of the Moorefield Presbyterian Church for nearly forty years. He is survived by one daughter, Miss Cary VanMeter, of Herndon, Va., and one sister, Mrs. Charles Mansfield, of New London, Conn. The body was brought to Moorefield for interment. Source: The Cumberland Evening Times; Cumberland, Maryland; May 29, 1940; page 13. Maysville, W. Va., Dec. 10 - Homer Van Meter, 48, died Monday at his home near Maysville. He was a son of Mr. and Mrs. Elijah Van Meter, Landes, and is survived by his wife, Mrs. Hannah Shirk Van Meter and three sons and two daughters, Maysville; and three brothers, Garfield, Eston and Andy Van Meter, Pansy. Source: The Cumberland Evening Times; Cumberland, Maryland; Dec. 10, 1941; page 13. We have now to record the death of one of the old Patriarchs of the South of the Potomac, Isaac Vanmeter, Esq., departed this life at his residence in Hardy County, on the night of the 13th inst. His age was upwards of eighty years. It may be said of him that he descended to the grave like a shock of corn fully ripe, leaving behind him a large number of descendents in whom he was as happy as it falls to the lot of most men to be in this world; to whom he was more and more endeared to the last, while they clustered round him with all that filial love, tender regard, and veneration, to which, he was so well entitled & tho' he had been spared to them beyond the ordinary period of human life, his death afflicted them, with he keenest distress. During his life, all the transactions in which as a man of a large property, he was of course engaged, no man ever had cause of complaint against him. He well deserved the confidence and esteem of his fellow citizens, which from the earliest period of his life he so fully possessed. As a justice of he peace for his county, he was venerated for his intelligence, uprightness & humanity and as a proof of the well merited confidence of his fellow citizens, he was elected as a member of the Convention for the State of Va., to which the Federal Constitution was submitted for adoption or rejection in 1788, and wisely voted for its adoption, against all the thunder of the eloquence of Patrick Henry; and was frequently elected as a member of Legislature of Va, both before and after that period, when higher qualifications were sought for to fill that station than are at the present time. Wise and judicious benevolent and kind, he never said or did anything willfully to hurt the feelings of a human being. Always charitable to the poor; as a professor of the Christian religion he aided most liberally every institution which had the amelioration of the condition of man, or the propagation of that religion for its object; and he died in the cheering and consolatory hope which that religion inspires. He was one among the last, if not entirely, the last of the old stock of inhabitants who occupied the South Branch Manor at an early day, when the savages frequently drenched those fertile lands in their blood. And, although in the course of nature his death was to be expected, yet it seems to sound like the fall of the last tall oak of the forest, whilst a younger growth were shooting up vigorously around him. His grand-father was one of the first who discovered that garden spot of Virginia, and he succeeded in appropriating to himself a large and choice portion of those rich lands; and although he fell a victim to savage ferocity, the greatest part of his acquisition remains with his descendants to the present time, along with other acquisitions of their own; From the high esteem and regard which the winter of this obituary lies for the subject thereof he has been induced to give this small portion of his history, knowing that the same sentiment will be reciprocated by all who knew the deceased. Isaac L. VanMeter, 82, retired track foreman for the Western Maryland railway, died yesterday at the home of his daughter, Mrs. J. R. Swaner, 148 Main street, Ridgeley, W. Va. Born at Petersburg, W. Va., Mr. VanMeter was a son of the late Philip and Susan Porter VanMeter. He was a member of the Methodist church at Dawson. Surviving besides Mrs. Swaner are three other daughters, Mrs. R. N. Ravenscroft, Keyser, W. Va.; Mrs. J. K. Williamson, Mrs. S. A. Ross, Lonaconing; five sons, John H. VanMeter, Luke; Vernon, Stanley and Wilbur, Ridgeley; Grover C. VanMeter, Cumberland; and 52 grandchildren. James W. VanMeter, 65, of 112 Shaw Place, died Thursday in Sacred Heart Hospital. He was a native of Dawson, a son of the late Isaac and Hannah (McKenzie) VanMeter. He was a retired employe of the Celanese Fibers Corp., a member of the Textile Workers of America Union and a member of the Fraternal Order of Eagles. He is survived by his widow, Cora R. (Cruthers) VanMeter; three stepsons, Richard and William Newhouse, both of Baltimore, and John Newhouse, Mexico; two stepdaughters, Mrs. Betty Pichey, Baltimore, and Mrs. Pearl Norman, of Florida; one brother, Stanley VanMeter, Ridgeley; three sisters, Mrs. Bessie Ross, Midland; Mrs. Grace Williamson, Keyser, and Mrs. Edith Swainer, Ridgeley, and ten grandchildren. Services will be conducted Monday at 2 p. m. at the Stein Funeral Home by Rev. J. Finley Cooper, rector of Emanuel Episcopal Church. Interment will be in Sunset Memorial Park. Pallbearers will be William Cook, Charles Bergman, Louis Johnson, Jesse Hamilton, Raymond Lidinger and Paul Morgan. Friends will be received at the funeral home today from 2 to 4 and 7 to 9 p. m.
A telegram was received here this week announcing the death of James Wright VanMeter, youngest son of Mr. and Mrs. D. P. VanMeter, youngest son of Mr. and Mrs. D. P. VanMeter, at his home in Kewande, Canada. The young man has only been sick a few days. The many friends of Mr. and Mrs. VanMeter join us in extending sympathy to them, in their dark hour of trial. PETERSBURG - Jason Garfield Van Meter, 80, of here died early today at Rockingham Memorial Hospital, Harrisonburg, Va., where he had been a patient one week. He had been ill for some time. A son of the late Daniel and Sarah (Katherine) Kimble, he was married Lucy Edith (Sears) Van Meter in 1906 at Lanesville, W. Va. Besides his widow, he is survived by four daughters, Mrs. Dorothy Fuller, Huntington, W. Va., Mrs. Alice McLawhorn, Alexandria, Va., Mrs. May Alt, of here, and Mrs. Marie Mongold, Washington; six sons, Garfield, Clarence, Elvin, and Carl Van Meter, all of here, Earl Van Meter, Cabins, and Sgt. Raymond Van Meter, who is serving with the Army in Germany; one sister, Mrs. Rosie Alt, Dorcas, W. Va.; two brothers, Andy Van Meter, of Landis, W. Va.; 22 grandchildren and three great-grandchildren. One daughter preceded him in death. The body is at the Schaeffer Funeral Home here where the family will receive friends after 6 p.m. today. Source: The Cumberland Evening Times; Cumberland, Maryland; Dec. 28, 1960; page 9 & 16. LUKE — John Herbert Vanmeter, 77, of Fairview Street, Extended, died yesterday morning in Sacred Heart Hospital, where he had been a patient three weeks. A native of Cresaptown he was a son of the late Isaac L. and Hannah (McKenzie) Vanmeter. Mr. VanMeter had resided here 32 years, and was a retired engineer from the Western Maryland Railway Company. He retired in 1947 due to ill health after 25 years of service. During his railroad career, he worked the Georges Creek division and in the yards of the Luke Mill of the West Virginia Pulp and Paper Company. He was a member of the Church of God of Piedmont. Survivors include his widow, Mrs. Fredericki (Whetzel) VanMeter; four daughters, Mrs. Jean Miller, and Mrs. Janet Guy, both of here; Miss Louise Vanmeter, Baltimore, and Mrs. Rose Brown, Cresaptown; two sons, Bernard Vanmeter, of Monaca, Pa., and Roy Vanmeter, Cumberland; three brothers, Stanley and Vernon Vanmeter, Ridgeley, and Wilbur Vanmeter, Cumberland; three sisters, Mrs. Grace Williamson, Keyser; Mrs. Bessie Ross, Midland, and Mrs. Edith Swaner, Ridgeley; 18 grandchildren and nine great-grandchildren. The body is at the Boal Funeral Home where services will be conducted tomorrow at 2 p. m., by the Rev. C. D. Coley, pastor of the Cumberland Church of God. Interment will be in Philos Cemetery. Friends will be received at the funeral home today from 2 to 4 and 7 to 9 p.m.
PETERSBURG WV - John William, aged 17 months, son of Dr. and Mrs. W. C. VanMeter, died on Mon,July 29, 1912, at their home at Petersburg. Keyser, W.Va., July 31 - The inquest into the death of Melvin VanMeter, 33, of Dawson, Md., killed Monday at Gerstell, W. Va., by a Western Maryland Railway locomotive, has been postponed until the engine crew from Ridgeley, W. Va., returned from its run and can come to testify. The inquest began Tuesday night before a jury by Justice Arnold Rafter, setting coroner, when several witnesses were heard. VanMeter was apparently asleep on the track. Milton George VanMeter, 73, former postmaster of Cresaptown and proprietor of VanMeter's Market in that community, died yesterday in Memorial Hospital where he was admitted Sunday. He was a son of the late Jacob C. and Anna (Hutson) VanMeter. In 1896, after the death of his father, he took over active management and ownership of the business establishment which was founded in 1880. At that time Mr. VanMeter was 16 years of age. He was named postmaster in 1906 and served 43 consecutive years until he was retired by the Post Office Department in 1949. He continued to manage the store until early in July of this year when he retired. Mr. VanMeter was a member of the Board of Trustees of Cresaptown School and for many years was a member of the Board of Trustees of Cresaptown Methodist Church. He was also a member of Council 49, JOUAM. Surviving are his widow, Mrs. Clara Belle (Brotemarkle) VanMeter; three sons, Marshall M. VanMeter, Cresaptown; M. Claudis VanMeter, Potomac Park, and Clayton VanMeter, Cresaptown; three daughters, Mrs. W. A. McGraw, city; Mrs. Richard McKee, Morgantown, W. Va., and Mrs. Richard T. Stouffer, Cresaptown; a brother, Judge J. French VanMeter of Allegany County Orphans Court, also of Cresaptown; a sister, Mrs. Hayes E. Robinette, Cresaptown; 14 grandchildren and a great grandchild. The body is at the residence. PETERSBURG - Otis B. VanMeter, 70, of Cabins, died last night in Weston following a lingering illness. Born in Grant County, he was a son of the late Daniel and Sarah (Kimble) VanMeter. Surviving are his widow, Mrs. Alice V. (Kimble) VanMeter; three sons, Kermit VanMeter, Cabins; Mervin VanMeter, Falls Church, Va., and Clinton VanMeter, Annapolis; six daughters, Mrs. Gerna C. Judy, Edinboro, Va.; Mrs. Macil Dolly, Winchester, Va.; Mrs. Dora Alt, Betersburg, and Mrs. Goldie Shirk, Mrs. Thelma Shreeve and Mrs. Gaynell Shreeve, all of Cabins, and a brother, Andrew VanMeter, Landis. The body will be at the Schaeffer Funeral Home where friends will be received tomorrow. Source: The Cumberland Evening News; Cumberland, Maryland; April 19, 1963; page 14. Tabitha Inskeep VanMeter was born in Hardy Co., West Virginia, November 26, 1846, and died at her home in Mansfield, Ill., July 28, 1911, after an illness of a few weeks. In 1867 she removed with the family to Illinois and since that time has made this state her home. Frostburg. May 21.—Funeral services for Thaddeus VanMeter, who was found dead Tuesday on his farm near Mt. Savage, were held today at Petersburg, W. Va., where the body was taken to the home of his sister, Mrs. Mattie Davis. Interment was in the family lot at Petersburg. McCOOLE - Willie I. VanMeter, 67, of 255 Maryland Avenue, died yesterday at his residence. Born in Petersburg, he was a son of the late Isaac and Minnie (Conrad) VanMeter. He was a member of the Allegany Baptist Temple and was a former employe at Westvaco’s Luke Mill. He is survived by his widow, Mrs. M. Isabelle (Pennington) VanMeter; a sister Mrs. Etta B. Collins, Rawlings; a borhter Bernie VanMeter, here; and several nieces and nephews. The body is at the George Funeral Home, Cumberland, where friends will be received today from 7 to 9 p.m. Services will be conducted tomorrow at 1 p.m. at the funeral home by Rev. Richard A. Richardson. Interment will be in Waxler Cemetery. SOURCE: The Cumberland Evening Times; Cumberland, Maryland; Oct. 14, 1974; page 5. Aug 29 - Mr James M Vanmetre, one of the best known and wealthiest farmers of Berkeley county, died at his home near Kearneysville, this morning 80 years of age. He was twice married, first to Miss Welshaws. His second wife, who survives, was Miss Cook. He leaves five children, among whom are L D Vanmetre, a prominent farmer, and George W Vanmetre, a civil engineer...rest of article unavailable. Friendsville - Mrs. Annie (Catherine Anna Frazee) Van Sickle, 82 (born February 14, 1880), died yesterday (August 25, 1962) at the home of her daughter, Mrs. Albert ( Hiley Mabel) Inks, near Friendsville. She had been ill the past two months. She was a daughter of the late Jeremiah and Hiley (Boyer) Frazee. Her husband (John Herbert) preceded her in death (November 1941). Besides Mrs. Inks she is survived by a brother, Alex Frazee, Friendsville. The body is at the residence of her daughter. A service will be conducted tomorrow at 1:30 p. m. Blooming Rose Methodist Church. Rev. Charles Hinkle will officiate and interment will be in the church cemetery. Funeral services for Charles T. VanSickle, aged 77 years, four months and 22 days, who died at his home in North Avenue, near Glade’s Farm, W. Va., on Saturday, February 19, 1927, were held in the home Monday afternoon followed by burial in the family cemetery. Mr. VanSickle was born on September 30, 1849. He is survived by his wife and four daughters, Mrs. Walter Bartholomew of Oakland, Md. ; Mrs. Walter Moyers of Uledf, Pa.; Mrs. W. T. Arthur of Hazelton, W. Va., and Mrs. Charles Frazee of Uniontown. Twelve grandchildren, three great grandchildren and six half-brothers and two half-sisters also survive. Source: The Morning Herald; Uniontown, Pennsylvania; Tuesday, February 22, 1927; page 11. Doris J. VanSickle, age 53 years, of Markleysburg, passed away suddenly March 16, 1992. She was born January 28, 1939, at Maidsville, W.Va., daughter of the late Robert S. and Rachel Langley VanSickle. Surviving are a brother, Robert S. VanSickle, Jr., of Markleysburg, and a sister, Hazel Hincky, of Waldorf, Md. She was a member of the Union Chapel Church in Markleysburg where she served as Sunday School Superintendent for 36 years. Friends will be received in the Donald R. Crawford Funeral Home, Markleysburg, today, 2-9 p.m. and Thursday in the Union Chapel Church, 10-11 a.m., the hour of service with Rev. John Eash officiating. Interment in Sansom Chapel Cemetery. VANSICKLE, ELMA A. (FRIEND)- Age 72 years of Route 1, Friendsville, Md., died Tuesday, December 13, 1977 in Garrett County Hospital, Oakland, Md. She was born September 16, 1905 in Friendsville, the daughter of the late Harvey and Cora Friend Fike. She was a member of United Pentosial Church. She was preceded in death by her first husband, Ross Friend, and one son, Thomas. Surviving are her husband, Carl VanSickle; two sons, Gerald Friend of Monaca, Pa. and Orval Friend of Baltimore, Md. ; two daugthers, Miss Joy Friend of Friendsville, Md. and Mrs. Katherine Younkin of Ursina, Pa.; two brothers, Norris Fike of McHenry, Md. and Melvin Fike of Richmond, Va.; one sister, Mrs. Alverta Hone of Friendsville, Md. ; eight grandchildren; seven great grandchildren. Friends will be received in the Newman Funeral Home, Friendsville, Md. today from 7 to 9 p.m., Thursday from 2 to 4 and 7 to 9 p.m. where services will be conducted Friday at 2 p.m. from the United Pentosial Church with Rev. Roy J. Riffle officiating. Interment in Steele Cemetery. The body will be taken to the church at 1 p.m. Source: The Evening Standard; Uniontown, Pennsylvania; December 14, 1977; page 49. Enos T. VanSickle, 83, of Markleysburg, died Sunday in the Cumberland Memorial Hospital, Cumberland, Md. He is survived by his wife, Naomi; three sons and four daughters, Edward Herring of Meadville, Pa., Mrs. Betty Smitley of Markleysburg, Mrs. Arlene McCarty of Confluence, James Herring of Markleysburg, Shirley Michaels of Friendsville, Md., Donald VanSickle and Carol Dean, both also of Friendsville, Md. ; 26 grandchildren; several great-grandchildren; one sister, Lucinda VanSickle of White Hall, Md. ; several nieces and nephews. The family will receive friends at Crawford Funeral Home, Markleysburg, this evening from 7-9 p.m., Tuesday from 10 a.m. to 9 p.m., and on Wednesday at 11 a.m.
Glenn L. VanSickle, Sr., of Owings Mills, passed away on October 3, 1985. Beloved husband of Mina M. VanSickle (nee Crawford) and devoted father of Madge A. Beiley, Glenn L. VanSickle, Jr., Leah J. Haines and Edward H. VanSickle, Sr.; brother of James J. and Pauline E. VanSickle; Also survived by 12 grandchildren and 23 great-grandchildren. Services from the Eline Funeral Home, Reisterstown Road, Saturday at 8 p.m. Interment in Garrett County Memorial Gardens. Miss Jane VanSickle, 72 years, four months and 17 days old, died Sunday, April 7, 1930, at 10:30 a.m. at the home of her sister, Mrs. Lillian Fike, Georges township, of pneumonia. In addition to Mrs. Fike she is survived by another sister, Mrs. Mary M. Gibbs, Friendsville, Md., one brother, Charles VanSickle of Markleysburg and one half brother, Alexander Fike, Bruceton Mills, W. Va. The funeral cortege will meet at the Fike home at 11 a.m., Tuesday and drive to Asher Glade church near Markleysburg where funeral services will be held at 2 o’clock. Burial will be in the VanSickle cemetery, near there. Source: The Morning Herald; Uniontown, Pennsylvania; Monday, April 28, 1930; page 12. Lucinda A. VanSickle of White Hall died Nov. 11 at Mariner Health of Bel Air. She was 85. She was the daughter of the late Amos and Ida Sumey VanSickle. Ms. VanSickle was formerly a waitress. Ms. VanSickle is survived by a niece, Linda Crabill; a nephew, Robert Crabill; and was the great-aunt of Stephanie Batton and Matthew Crabill. Services will he held today (Wednesday) at 11 a.m. at Evans Funeral Chapel in Forest Hill with the Rev. R. Dennis Schulze officiating. Burial will be at Thomas Cemetery in Markleysburg, Pa.
Funeral arrangements have been completed for Mrs. Margaret S. Goss VanSickle, aged 46, of 2 Auslin street, whod died a 6:45 Friday morning, October 1, 1948, after a nine-month illness. Friends are being received at the Minerd Funeral Home where rites will be conducted at 2 Monday afternoon. Dr. Aiden L. Allen will officiate and burial will follow in Redstone cemetery, Brownsville. Members of the Ladies Auxiliary of United Spanish-American War Veterans will conduct the ritual in the funeral home at 7:30 Sunday night. Born at Bellwood, Blair county, she was a daughter of Charles C. and Minne D. Curtins Goss. She was a member of Calvary Methodist church, the Dorcas Class, Circle Five, the Missionary Society of the church, and was active in Sunday school work. She was a Den Mother of the Cub Scouts and vice commander of the Spanish-American War Veterans’ Ladies Auxiliary. Surviving are her husband, Harry Owen VanSickle; her father, Charles C. Goss, of Chicago; four children, Cloyde, Harry D., Irvin and Barbara Ann, all at home; a bother Daniel Goss of Brownsville; two sisters, Mrs. Mary Ecklund of Chicago, and Mrs. Minnie Hill, of Buffalo, N. Y. Source: The Morning Herald; Uniontown, Pennsylvania; Saturday, Oct. 2, 1948; pages 1 & 14. Noah Van Sickle, 81, of Cheat Neck died Wednesday morning at Vincent Pallotti Hospital following a long illness. He was born May 8, 1878, at Fearer, Md., a son of the late Isaac and Martha Fike Van Sickle. He was a member of the Fletcher Methoside Church in Cheat Neak. Surviving are his wife, Olive Patton Van Sickle; two sons, Ray Z. of Morgantown and Lawrence D. of Columbus, Ohio; one daughter, Miss Myrtle Van Sickle at home; one brother Daniel Van Sickle of Smithfield, Pa.; two sisters, Mrs. Mary K. Burgess and Mrs. Alice A. Casteel of Mount Morris and two grandchildren. There is also one son and one daughter deceased. SOURCE: The Dominion News; Morgantown, West Virginia; July 30, 1959; page 2. VAN SICKLE, Noah, 81, of Cheat Neck, died Wednesday at Vincent Pallotti Hospital. Friends may call at the Hastings Funeral Home after 11 a.m. Thursday and services will be held at the Funeral Home Friday at 2:30. Interment will be in the Blaney Cemetery. The Rev. William E. Camp will officiate services. Van Sickle, Rachel -- Age 73 years, of Flat Rock Road, Markleysburg, died Friday, Feb. 24, 1964. She was born Oct. 3, 1908, in New Salem, Pa., daughter of the late Clark and Ida Langley. Surviving are her husband, Robert Van Sickle; three children, Doris Van Sickle and Robert Jr., both at home, and Mrs. Hazel Hinchy, Waldorf, Md. ; five grandchildren; two sisters, Mrs. Ruth Smith, Fairchance, and Mrs. Margaet Ruddy, Fla. She was predeceased by a sister, Nettie Langley. She was a member of the Union Chahpel Church, Markleysburg. Friends will be received in the Union Chaepl Church, Markleysburg, today noon to 2 p.m. the hour of service. Rev. Harold Ringler and Rev. Ivan B. Walker, will officiate. Interment in Sansom Chapel Cemetery. Funeral arrangements are under the direction of the Donald R. Crawford Funeral Home, Hopwood. FRIENDSVILLE - Ray C. VanSickle, 47, of Friendsville, died suddenly Friday near his residence. A native of Friendsville, he was a son of the late Lloyd and Lavina (Sliger) VanSickle. Mr. VanSickle was employed as a nailing machine operator by the Coddington Lumber Company. A World War II veteran, he was also the leader of the Ahser Glade 4-H Boys unit and belonged to the Friendsville Volunteer Fire Department. Surviving are his widow, Mrs. Beryl (Friend) VanSickle; a brother Clyde VanSickle, Friendsville, and two sisters, Mrs. Leona Trimpey, Somerset, and Mrs. Flora Welch, Baltimore. The body is at the residence. Services will be conducted today at 2 p.m. at the Sand Spring Church of God by Rev. Joseph Lewis and burial will be in the church cemetery. Members of the 4-H Boys unit will be honorary pallbearers. Source: The Cumberland News; Cumberland, Maryland; August 9, 1965; page 5. Robert S. VanSickle, Sr., age 75 years, of Flat Rock Road, Markleysburg, Pa., died Thursday, August 22, 1985. He was born Oct. 3, 1909, in Markleysburg, Pa., son of the late Amos and Viola VanSickle. He was predeceased by his wife Rachel in 1984. Surviving are three children, Doris VanSickle and Robert, both at home, and Hazel Hinchy, Waldorf, Md. ; five grandchildren; two brothers, Enos and James, both of Markleysburg; a sister, Cindy, Baltimore, Md. He was a member of Union Chapel Church, Markleysburg. Friends received in the Donald R. Crawford Funeral Home, Hopwood, this evening, and Saturday in the Union Chapel Church, Markleysburg, until the time of service at 1 p.m. Rev. David Emerson and Rev. Harold Ringler will officiate. Interment in Sansom Chapel Cemetery. FRIENDSVILLE - Samuel VanSickle, 82, died yesterday at his home after an illness of one week. A native of Friendsville, he was a son of the late George and Elizabeth (Sisler) VanSickle. Surviving are his wife, Grace (Sisler) VanSickle; three sons, Perry and Joseph VanSickle, here; Lloyd VanSickle, Capitol Heights; one stepson, Ray VanSickle, here; four daughters, Mrs. Sara Wakefield and Mrs. Maude Lowdermilk, here; Mrs. Sadie Fazenbaker, Accident; Mrs. Katie Eisentrout, Hazelton, W. Va.; a brother, Lewis VanSickle, Cranesville, W. Va.; 38 grandchildren and a number of great-grandchildren. The body is at the Newman Funeral Home, Grantsville. A service will be conducted tomorrow at 2 p.m at Laurel Run Church of God. Rev. Howard Pent, pastor, will officiate and interment will be in Blooming Rose Cemetery. Source: The Cumberland Evening Times; Cumberland, Maryland; June 6, 1966; page 16. James C. Varner, 71, 630 Lincoln Street, city, died Friday. Born in Parsons, W. Va., he was the son of the late David and Delphia Varner. He retired in 1973 as an engineer with the Baltimore and Ohio Railroad after 29 years of service. Surviving, are his widow, Anna Mary (Hayes) Varner; two daughters, Mrs. Gloria Beeseck, Bedford, Pa.; Mrs. Barbara Weakley, Ridgeley; W. Va.; three brothers, Arden Varner, Cresap Park; Clyde Varner, Baltimore; Burley Varner, Fairgo; five sisters, Miss Ella Varner, Fairgo; Mrs. Maza Thompson, Fairgo; Mrs. Zona Potts, here; Mrs. Martha Lashley, Claysville; Mrs. Mary Paton, Hagerstown, and five grandchildren. Services will be conducted at the Wright Funeral Home today at 11 a.m. by the Rev. Stanley E. Weese. Interment will be at Rest Lawn Memorial Gardens. Mary Weeks Vaughn died at her home in Pekin Friday evening, after an illness of only six days. She was the widow of Samuel Vaughn, at one time prominent in local labor movements. She is survived by three sons and three daughters: John G., of Charlestown; Charles H., Minersville, W. Va.; Samuel F., of Pekin; Mrs. Anna A. Clark, of Moscow; Mrs. Joseph D. Robertson, of Borden Shaft; Miss Ethelina (? ), of Pekin and Mrs. John A. Donald, of Lonaconing, and one brother in New York. Mrs. Vaughn was a native of Gloustershire, England, and came to this country about 15 years ago with her husband and two children, settling in Pottsville, Pa. They came to Pekin in 1884. Mr. Vaughn was an enthusiastic and very active member of the Knights of Labor during the existence of that organization. The body of A. S. Veach, of Burlington, from six months a fugitive from justice, who died at a Baltimore hospital Saturday just before he was to be arrested by Burns detective, was sent to his home yesterday. Veach was charged with fraudulently using $10,000 given on a note endorsed by John A. Parker and John Bane, wealthy farmers. The money was to be used in settling the affairs of A. S. Veach & Co. which had failed for $25,000. Some Baltimore firms were among those who lost. After obtaining the money on the notes at Cumberland six months ago, Veach went to Oklahoma, where he has said to have made investments. In the meantime, his son, J. A. Veach was arrested. The elder Veach arrived in Baltimore about a week ago with the Burns men close behind him. They traced his movements to a hotel in the city and then to a hospital. Not until a short time before his death, did he reveal his identity, when he requested one of the hospital attendants to notify his relatives in West Virginia. The body of Mr. Veach arrived here Tuesday night on No 7 and was taken in charge by H. S. Thompson and conveyed to Purgitsville, where, on Wednesday it was buried beside his last wife. The services were conducted by Rev. George Burgess. Died suddenly at the home of his brother, Mr. John Veach, Burlington, this county, Wednesday May 10, 1911, about 9:30 AM, Mr. Clyde Earl Veach. He would have been 23 years old next month. Until about two weeks ago, he had been in the mercantile business at Petersburg W. Va. Several days ago he came to Burlington and had not been feeling well for a short time, though able to go about. Wednesday morning he arose as usual and attempted to attend to business, but feeling worse, a physician was summoned about half past eight o'clock, who ordered him to bed, where he expired about one hour later, while in conversation with his brother. He was a son of Mr Abel S Veach, of Purgittsville. His mother died about one year ago. He leaves two brothers, who are merchants at Burlington, and a married sister. The deceased was a young man of strikingly handsome appearance, and his agreeable disposition and charming personality won for him friends wherever he was known. A large circle of acquaintances mourn his sudden and untimely death. He was buried at Purgitsville this forenoon. The funeral services were conducted by Rev A A P Neel. The untimely death of Clyde Earl Veach, who passed so suddenly away at the home of his brother, John A Veach, in Burlington, Wed morning, May 10th, at 9:30 o'clock, is almost unprecedented. Until a few weeks ago, he was the picture of health and gave promise of a long life. On Fri, he was brought home from Petersburg, where he was engaged in business, to Burlington. He was feeling badly, but was not considered dangerously ill until Wed morning, when he passed away without warning. He was kind, genial, thoughtful and courteous, and his pleasing manner and thoughtfulness of others gained for him many friends. His fine and manly bearing gave him prestige among all he met. Although strong and manly, his heart was strung with a tender chord. This was especially manifested in his frequent visits to his mother's grave, where he would often spend hours, sometimes in sleet and rain. His sudden passing away deprived him of any immediate preparation for the future life, and the opportunity to speak a word to his friends and relatives. He had, however, signified his intention to unite with the church and among the few things found in his satchel was a nice Bible. A very impressive funeral service was held in the Methodist Church at Purgittsille, by the pastor, attended by a large concourse of friends. He was laid to rest beside the mother he had loved so tenderly. The passing of this strong young man, just 23 years of age, reminds us that death is no respecter of youth, and well we may enquire as to his next victim. Gerald Veach, a young man in the marine service, died Nov 11th at the naval hospital, Portsmouth Va, of hemorrhage of the brain. He is a native of Hampshire Co, a son of the late A. S. Veach. His body will be buried in Pine Church cemetery, at Purgittsville. One brother, Jno A. Veach, of Purgittsville, and one sister, Bessie, who lives in Utah. James Edward Vena, Jr., 48, of 715 St. Paul Rd., Meyersdale, Pa., died as a result of a construction accident near Pittsburgh. Born January 30, 1955, in Meyersdale, he was the son of James and Lela (Hay) Vena, Meyersdale. Mr. Vena was a member of St. Paul Wilhelm United Church of Christ. He was employed by Astco Construction Co. in roads construction and was a member of Laborer's Union, Local 1058, Pittsburgh. He was a member of Salisbury Sons of the American Legion and was a 1972 graduate of Salisbury-Elk Lick High School. Jim was an avid Harley-Davidson motorcycle enthusiast. In addition to his parents, he is survived by two sisters, Sherry Ways and husband William, Alexandria, Va.; Patti Deal and husband Ken, St. Paul, Pa.; niece and nephew, Andrea and Todd Deal. Friends will be received at the Newman Funeral Home, Inc., 9168 Mason-Dixon Hwy., Salisbury, Pa., on Friday, 7-9 p.m. and Saturday, 2-4 & 7-9 p.m. Services will be conducted on Sunday at 2 p.m. at St. Paul Wilhelm United Church of Christ with the Rev. Bruce Ashlock officiating. Interment will be in the church cemetery. Friends may call at the church one hour prior to the services. Expressions of sympathy may be directed to the youth program at St. Paul Wilhelm Church. GRANT COUNTY - Ed Venemon died last Thursday night at 9 o'clock at his home here of cancer of the stomach. He had been sick for some time. Burial took place Saturday afternoon in Maple Hill cemetery. MT STORM - One of the saddest deaths we have been called upon to report occurred here Sun morning, when the soul of Mrs Lulu Belle Verley, wife of C H Verley bid adieu to earthy scenes and took flight to the spirit world. Mrs Verley had been very poorly but was thought to be well on the way to recovery. Mr Verley had gone to Hartmonsville early in the morning for medicine. On his return he was met by a neighbor who conveyed to him the sad news that his wife was dead. Mrs Verley was thirty two years and one day old. She was converted last fall and united with the Methodist church. The funeral, which was held at the home on the Groves place, was conducted by her pastor, Rev C D Johnson. Besides a mother, father, two sisters and a brother, there are left to mourn the loss of the departed a husband and seven small children. (The eighth and last child having been buried just a few days before).The sympathy of the entire community goes out for the motherless children and the bereaved husband. Mr Verley is a hard working man, who supported his family by day's work. His aged mother also made her home with him and is depending upon him for support. F C Rollman was undertaking. Mrs Lowell Vernett died at the home of her daughter in Davis W Va, Aug 15, in her 77th year. She was born in Liverpool, England, and came to this country when she was about 16 years of age. For the last twenty years she had lived in Davis. Her husband died there. She is survived by the following children: Lawrence, Parkersburg; Wallace J, Pittsburg; Mrs J H Heltzen, Ft Defiance Fla; Mrs H A Donalds, Davis; Victor, Washington State; Herbert, Youngstown Ohio. "Uncle" Harry Vernon, pensioned yardmaster, died at his home on East Armstrong Street, Keyser, on the morning of December 27, following an illness of several months. Mr. Vernon was seventy-nine years old and had been pensioned for several years. Mr. Vernon was a favorite among his fellows and the high esteem in which he was held was shown by the beautiful flowers that covered his casket, sent there by the Railroad office forces and other friends. We extend to his sorrowing wife and children our heartfelt sympathy. James Vest, aged sixty-two years, died Mon night, May 13th, at his home in South Elkins. FROSTBURG - H. Anthony “Tony” Via, 73, of 181 West Main Street, Frostburg, died Sunday, Dec. 22, 1991, at Spartanburg Regional Medical Center in Spartanburg, S.C. Born July 28, 1918, in Frost burg, he was the son of the late Frank and Saveria (Sicoli) Via. He was preceded in death by four brothers, Anthony Via, Adam Charles Via, Alfred Via and Adolph Via. Mr. Via was a retired building superintendent for the Flour Daniel Construction Company in Spartanburg, where he resided from 1945 to 1965. He was a member of St. Michael’s Catholic Church, where he served as an usher. He was a veteran of World War II and a member of American Legion Farrady Post 24. Surviving are one son, David A. Via, Spartanburg; one daughter, Judy Camp, Inman, S.C.; one step-son, Bobby B. Walker, Greenville, S.C.; one sister, Catherine Zumpano, Middletown, N.Y.; one brother, Albert Via, Frostburg; six grandchildren and four great-grandchildren. Friends will be received at the Sowers Funeral Home. Mass of Christian Burial will be celebrated Saturday at 10 a.m. at St. Michael’s Catholic Church by Msgr. John L. Reinsfelder. Interment will be in the church cemetery. Pallbearers will be John Rafferty, Lionel Norris, Phillip Via, James Kelly, David Willetts and Thomas Mullen. HUNTINGTOWN- Esther Ileen Viands, 81, of Huntingtown, formerly of LaVale Terrace, LaVale, died Wednesday, June 21, 2000, at the home of her son. Born June 6, 1919, in Wiley Ford, W.Va., she was the daughter of the late Harvey Eugene and Ruth Mary (Fledderman) Abe. She also was preceded in death by her husband, Raymond Viands, Feb. 28, 1996; one daughter, Linda Raye Viands Swauger; and one brother, Buddy Abe. Mrs. Viands was a member of Southminster Presbyterian Church and Cumberland Chapter #56 Order of the Eastern Star. Surviving are one son, Gregory A. Viands and wife Rebecca Lynn, with whom she resided since October, 1997; one daughter, Barbara Kaye Ballard and husband William, Millersville; three brothers, Alfred Abe and wife Elizabeth, Middleburg, Va., Ronald Abe and wife Loretta, Perry Hall, and Willard Abe and wife Patty, Cape St. Claire; six grandchildren, Wayne Ballard and wife Dottie, Cape St. Claire, Lisa (Ballard) Kundrat and husband John, Columbia, Tanya (Viands) Vanderveen and husband Eric, Akron, Ohio, Kristen (Viands) Marshall and husband Dave, Severna Park, Erin (Viands) Ottosen and husband Ryan, Lake Havasu City, Ariz., and Lucinda (Swauger) Jackson and husband Tim, Brooklyn, Md. ; seven great-grandchildren, Jeremy Jackson, Paul Jackson, Matthew Ballard, April Ballard, Nicholas Kundrat, Taylor Vanderveen, and David Marshall Jr.; one son-in-law, Tom Swauger; and one brother-in-law, William Viands and wife Margaret, Wiley Ford. Friends will be received at the Scarpelli Funeral Home, P.A., 108 Virginia Ave., Cumberland, Friday from 3 to 5 and 7 to 9 p.m. Funeral services will be conducted at the funeral home Saturday at 10 a.m. with her nephew, Father John Abe officiating. Interment will be in Hillcrest Memorial Park, Cumberland. Cumberland Times-News, Wednesday, March 31, 2004?? Mt. Savage, Md., Jan. 20 — "They blame me for dynamiting the house." That mysterious entry was written in the diary of John Neal Villa, 63, of Eckhart, Md., on a page for Jan. 5, 1950. This was 12 days before yesterday's blast and fire which leveled the mountain home of Mrs. Hannah McKenzie and killed her and her 13-month-old grandchild, Linda Sue Hubbard. Villa was found dead yesterday in a swampy, briary pasture nearby. His death was attributed officially to a heart attack—apparently the result of "considerable excitement"—but an autopsy disclosed flash burns on both legs and face and internal bleeding from a concussion injury. State's Attorney Morgan C. Harris, who made the diary public today says the note confirms a close relationship between Villa and Mrs. McKenzie. This relationship ceased, Harris said, after Villa was taken to juvenile court last September and sentenced to 10 days in jail for striking Shirley McKenzie, 14-year-old daughter of Mrs. McKenzie. Shirley was one of the three teen-agers who barely escaped from the demolished house. But no one—including the Villa family—could explain what Villa's Jan. 5 entry in his diary meant. It was written in crude handwriting and poor English. Harris said he is continuing investigation. He has asked an explosive expert from the DuPont Powder Co. to check into the blast. FROSTBURG, Feb. 10 — Mrs. Julia Villa, 61, wife of John Villa, Eckhart, died yesterday afternoon in Miners' Hospital where she was admitted Friday. Mrs. Villa was a native of Austria but had been a resident of Eckhart for many years. She was a member of St. Michael's Catholic Church. Surviving are her husband, three daughters, Mrs. Catherine Perkins, Mrs. Margaret Kersh, and Mrs. Frances Hopkins, all of Eckhart; five sons, John and Andrew, both of Frostburg, Steve, Eckhart, and Charles and James, both at home. A requiem mass will be held Wednesday at 9:30 a.m. at St. Michael's Catholic Church, and burial will be in the parish cemetery. Martha Evelyn Villa, 85, of Frostburg, went home to be with her Lord after a long illness with Alzheimer’s disease. Martha, a resident of Egle Nursing Home for 7 years, formally of New Hope Road, died Wednesday, October 2, 2002 at the nursing home. Born in Frostburg, on November 18, 1916, she was the daughter of the late Charles Albert Dickel and Julia Elizabeth (Kreitzburg) Weslow Dickel. Her beloved husband, John Joseph Villa, died in 1960. She was also prededed in death by her sisters Elizabeth Hershburger, Annie Wade, Julia Henckel and Katherine Watkins, and brothers Henry, Elmer, Mayford and John Weslow. Martha was a member of the Frostburg Nazarene Church. She will be remembered for her generosity of over 60 years of Christian work, having served her Lord in the capacity of Missionary President, Sunday School Teacher, church treasurer, Steward and faithful attendee. One daughter, Julia Villa Fisher and husband Ken of Frostburg, and a grandson, John Barak Fisher of Roanoke, VA, survive her. She is a beloved aunt to many nieces and nephews. Friends may call at the Hafer Funeral Service, P.A. Frost Mansion, 58 Frost Ave., Frostburg, on Friday from 3-5 and 7-9 PM. A celebration of her life will be held at the Frostburg Nazarene Church at 11:00 A.M. Visitation will begin at the church at 10:00 A.M. Interment will follow in Frostburg Memorial Park. The family wishes thank the staff of Egle Nursing Home for their special care and kindness given to Martha. You truly are angels of mercy. Memorial gifts may be made in memory of Martha to the Egle Nursing Home, 57 Jackson St., Lonaconing, MD 21539 or to the Alzheimer Society, 108 Byte Drive, Frederick, MD. FROSTBURG - Stephen F. Villa, 58, of West Chester, Pa., died yesterday at Chester County Hospital there. Born in Boswell, Pa., he was a son of the late John and Julia (Komatz) Villa, and was a former resident of Eckhart. He was employed by the Chester Tricot Company as foreman. Surviving are three daughters, Mrs. Joanne Engle, Frostburg; Mrs. Barbara Keister, Cresaptown; and Miss Deborah Villa, Eckhart; three sisters, Mrs. Catherine Perkins, Wrights Crossing; Mrs. Margaret Kerch and Mrs. Frances Hopkins, Eckhart; three brothers, Andrew and James Villa, here, and Charles Villa, Eckhart, and five grandchildren. The body is at the Hafer-Sowers Funeral Home. Isabella N. Warnick Villano, 91, formerly of Piedmont, W.Va., died Friday, October 10, 2003, at the Belair Nursing Home in Lower Burrell, Pa. Born November 23, 1912, in Lonaconing, Md., she was the daughter of the late Hubert Worgan and Isabella (Nelson) Worgan. She was preceded in death by two husbands, Edward T. Warnick and Pasquale Villano; and eight brothers and sisters, Miriam Griffith, Hubert Worgan, Harriet Lauffer, James Worgan, Charlotte Brooks, David Worgan, John Worgan and Malcolm Worgan. She was the last of her immediate family. Mrs. Villano was a graduate of Bruce High School, a member of Trinity United Methodist Church in Piedmont, and for years was active in various church organizations. She was chairperson of the Republican Party Poll Workers in Piedmont for a number of years. She is survived by one son, Edward M. Warnick and wife Karen, of Morgantown, W.Va.; two granddaughters, Debra Armfield and husband Samuel, of Hollis, N.H., and Kimberly Fitzsimmons and husband Roy, of Lower Burrell. She is also survived by six great-grandchildren, Robert, Samuel and Lauren Armfield and Zachary, Garrett and Dane Fitzsimmons. The family received friends Monday at the Fredlock Funeral Home in Piedmont. Funeral services will be held today at 1 p.m. at the funeral home with Rev. Bart Thompson, pastor of Trinity United Methodist Church, officiating. Interment will follow at Philos Cemetery in Westernport, Md. Mrs Genevieve Connelly Vilsak(sic, Vilsack), 47, wife of Herbert(sic,Hubert) A Vilsak, president of Vilsak and Fisher Manufacturing, died suddenly yesterday at her home 4371 Schenley Farms Terrace. Born in Braddock, Mrs Vilsak was the daughter of James and Genevieve Connelly. She is survived by her husband, a daughter, Genevieve and a son Herbert A Vilsak, Jr. Friends will be received at H Samson's, 537 Neville St, after 6 p m tonight. Requiem high mass will be celebrated noon Monday at St Paul's Cathedral. Vilsack Death Beating Angle Being Probed ~ Investigation Made In Pittsburgh May Lead To Prosecution ~ The sudden death April 20 of former resident of Cumberland, Mrs Hubert A. Vilsack, 47, of 4371 Schenley Farms Terrace, Pittsburgh, remained under investigation today following disclosure of details of injuries she suffered March 31 in Florida. Allegheny County Detective Joseph Devlin left Pittsburgh this morning for Miami with the results of a Pittsburgh investigation into Mrs Vilsack's death. Homicide investigators from the office of the Dade county, Florida sheriff have developed the fact that Mrs. Vilsack sustained a fractured jaw, a broken rib and contusions presumably from a beating, in her hotel room in the Miami Beach area March 31, 20 days before her death. Dr. Samuel P. Kleinman, house physician of the Kimberly Hotel where Mrs. Vilsack was a guest, in a statement to Deputy Sheriff Barron Shields and J. P. Bordeaux, declared: "Mrs. Genevieve Vilsack was under my care for injuries sustained about 1 am March 31, 1951. These injuries were the result of being struck severely several times in different parts of the body. These injuries were not the result of a fall." Dr. Jack Beckworth, a specialist, set Mrs. Vilsack's broken jaw and she remained in St. Francis Hospital Miami Beach, until April 7, when she returned to Pittsburgh. Here she received treatment from Dr. W. Harry Archer, oral surgeon. She was found dead in her home on the morning of April 20. A death certificate was issued by the county coroner's office and the funeral was set for Monday, April 23rd. As the result of information from friends of Mrs. Vilsack, District Attorney William S, Rahauser, of Pittsburgh, halted the burial of Mrs. Vilsack Monday, afternoon (April 23) after the funeral services and ordered an autopsy. The autopsy was performed by the coroner's physician, Dr. T G Hamilton, of St. Francis Hospital, Pittsburgh. He found death due to a coronary occlusion with a long history of heart ailment. He added that he found evidence of a broken jaw and a fractured rib received some time previously. He expressed no opinion as to whether the broken jaw and rib could have contributed to Mrs Vilsack's death. District Attorney Rahauser assigned Captain Devlin to the investigation. He took statements from Mrs. Vilsack's husband, her two children and from various physicians who had treated Mrs, Vilsack in the past. Prompted by Devlin's inquiries, Dade County authorities also began an investigation. Mr. Vilsack in a statement to Captain Devlin said that he had left Miami Beach to return to Pittsburgh before noon on March 31, the day Mrs. Vilsack was found in her room by two maids at 3 o'clock in the afternoon. Mr. Vilsack declares that his wife was all right when he left for Pittsburgh. Mrs. Vilsack, an active Civil Defense worker in World War II, was associated with several civic and social organization's to the city. Any prosecution as the result or Mrs. Vilsack's injuries or death would have to be instituted in Florida. Mr. and Mrs. Vilsack and other members of their family resided in Cumberland from the middle 1920's until about 1935. They first lived on Fayette Street and then after spending a period in California because of Mrs Vilsack's health, they returned here to reside on Braddock Road for several years. Predeceased by: infant daughter, Margaret L. Vinci, who died Feb. 24, 1940; sisters, Gladys Burkett, Anna Johnson, Edna Cameron, Edith Wiebrecht and Betty Robeson; and brothers, James, George, Leslie and Galen Staup. Burial: Tuesday, May 11, 2010, Laurel Hill Cemetery, Moscow Mills. Mr. John E. Vink died last Friday, June 14, 1912, at the home of Mr. and Mrs. Wm. T. Monday. Services were conducted by Rev. M. H. Keen, after which interment took place in Queen's Point cemetery. Mr. Vink leaves two daughters residing here. Mrs. W. T. Wells and Miss Della Vink. Herschell Vinson, near Stinson, heard an owl in the yard and secured his shotgun but failed to locate the intruder. He thrust the loaded weapon under the bed and forgot about it. Everett, aged 7, son of Mr Vinson, was setting on the bed, holding the baby in his arms when Kenneth, his 11 year old brother, not knowing the gun was loaded, pointed it at him and the weapon was discharged. Everett was killed instantly and the baby was frightful injured, one of its eyes being torn out and other wounds inflicted, but there is some hope for its recovery. FORT ASHBY, W.Va. — Robert P. Vititoe, 67, of Fort Ashby, W.Va., went home to be with the Lord on Sunday, Dec. 28, 2014. Friends will be received at the Upchurch Funeral Home, Inc., Route 28, Fort Ashby, on Saturday, Jan. 3, 2015, from 10:30 a.m., until 11:30 a.m. The funeral service will follow at 11:30 a.m. in the funeral home, with the Rev. Dr. Thomas Gulbronson and Fred Timbrook, officiating. Condolences to the family may be posted after Mr. Vititoe’s obituary at www.upchurchfh.com. Miss Alice Vocke, 22 years, youngest daughter of Frederick Vocke, formerly of Eckhart this county, died Wednesday at her home in Detroit, Michigan. Her mother died six weeks ago. Besides her father she is survived by two sisters, Mrs. Carl Ruge, and Miss Jane Vocke: and three brothers, Herman, William and George Vocke. The funeral will take place at 9 o'clock tomorrow morning from St. Anthony's Catholic Church, Detroit. "Frank J. Vocke, 82, died yesterday at his home, 326 Cumberland Street, following a lingering illness. A native of Allegany County, he was a son of the late John and Antoinette (Kuhlman) Vocke and was the last member of his immediate family. He had resided most of his life on the family farm on Vocke Road. Mr. Vocke was a member of SS. Peter and Paul Catholic Church and the Holy Name Society of the parish. Surviving are his widow, Mrs. Mary (Healy) Vocke; a daughter, Miss Mary Margaret Vocke, at home, and a number of nieces and nephews. The body is at the residence. A requiem mass will be celebrated Tuesday at 8 a. m. at SS. Peter and Paul Church and interment will be in the parish cemetery." Detroit, Mich - Frederick J Vocke, 74, a native of Allegany Co, Md, died last Sunday. He was a son of the late John and Anntonette Vocke and resided in Maryland until 18 years ago. Interment was in Mt Olivet Cemetery. Surviving are three sons, William, Herman and George; two daughters, Miss Jane Vocke and Mrs Paul Ruge, all of Detroit: two brothers, George A Vocke, Pittsburgh and Frank J Vocke, Cumberland, Md. Mr and Mrs Frank J Vocke and daughter, Margaret; Mr and Mrs John F Vocke and son, Jack all attended the services. "Mrs. Mary Hilda Vocke, widow of Frank J. Vocke, died last night at her home, 326 Cumberland Street. She had been in ill health for several months. A native of Vale Summit, she was a daughter of the late John and Margaret (Mallon) Healy. She was a member of SS. Peter and Paul Church and of the church's Christian Mothers Club. She is survived by a daughter, Miss Margaret Vocke, at home; a sister, Mrs. John A. Sullivan, Baltimore, and a brother, Michael J. Healy, Albuquerque, N. M. The body will be at the residence after 11 a. m. tomorrow." Mrs. Theresa Vocke, 64, wife of Frederick J. Vocke, formerly of Eckhart Mines, died Wednesday, April 17, at her home in Detroit, Mich. Funeral services were held Saturday morning from St. Anthony's Catholic Church there, with burial in Mt. Olive cemetery. Besides her husband, Mrs. Vocke is survived by three sons, William, Herman and George Vocke, and by three daughters, Mrs. Paul Ruge, and the Misses Alice and Jane Vocke. Mrs. Vocke was Miss Theresa Kelly of Eckhart Mines and a member of St. Michael's Church, Frostburg. MRS. ANNA M. VOGEL, of 449 Chestnut St., Indiana, died Monday, May 15, 1967, in the Indiana Hospital. Her husband, Edward G. Vogel, died March 26, 1967. Friends will be received after 7:30 p.m. today and on Wednesday from 2-4 and 7-9 p.m. at Robinson-Lytle's, Indiana, where Court St. Bernard 339 CDA will recite the Rosary at 8 p.m. Wednesday. Requiem Mass will be offered at 10 a.m. Thursday in St. Bernards Church, Indiana. Interment will be made in St. Bernards Cemetery. A complete obituary will appear in Wednesday's editions of the Indiana Evening Gazette. MRS. ANNA M. VOGEL 61, widow of Edward G. Vogel of 49 Chestnut St., Indiana, died May 15, 1967 in the Indiana Hosital. Born Oct. 31, 1905 in Midland, Allegany County, Maryland, she was the daughter of Thomas A. and Rose Ann Coburn Flanagan. Mrs. Vogel taught school in Monessen, for many years before moving to Indiana in 1945. She taught for several years in Indiana public schools and for the past 15 years has taught in St. Bernards parochial school. She was a member of St. Bernards Roman Catholic Church, and the Court St. Bernards No. 399 CD of A. Surviving is a brother, Francis D. Flanagan, of Roscoe. Friends will be received at Robinson - Lytel's in Indiana from 2 to 4 and from 7 to 9 p.m. today where Court St. Bernards No. 399 CD of A, will recite the Rosary at 8 p.m. this evening. Requiem High Mass will be celebrated in St. Bernards church on Thursday, at 10 a.m. Interment will be made in St. Bernards Cemetery, Indiana. Henry Vogel, 73, former city employe, died yesterday in Detroit, Mich., of a heart attack, he lived here until 20 years ago when he moved to Detroit to make his home. Mr. Vogel came to the United States from Germany 61 years ago with his uncle, the late Henry Vogel, this city. Surviving, are his widow, Mrs. Mayme Vogel; four daughters, Miss Katherine Vogel and Mrs. Roy Lovett, both of Detroit; Mrs. Edna Riley, of Baltimore, and Mrs. Victor R. Harshman, of South Bend, Ind., and a son, Fred Yeager, of Detroit. Funeral services and: burial will be in Detroit. Meyersdale, Pa., August 1 - Mrs. Annie (Meerbach) (sic: Merrbach) Vogtmann (sic: Voghtman), 71, wife of Carl Vogtmann, died yesterday morning at her home on Keystone street. She had been ill for some time. A daughter of Gotfredt and Catherine Meerbach, she was born in Maryland on January 10, 1870. In addition to her husband, she leaves a brother, John C. Meerbach, and a nephew, both of Frostburg. Mrs. Vogtmann had been a resident of Meyersdale 30 years. She a member or the Lutheran Church. Funeral services will be conducted Sunday afternoon by Rev. Howard K. Hilner. Interment will be in the Old German Lutheran Cemetery at Frostburg, Md. FROSTBURG — Mrs. Annie (Morgan) Vogtman, 83, of 15 South Grant Street, died yesterday in Memorial Hospital, Cumberland, where she had been a patient six months. She was the widow of Christian Vogtman. She was a member of Mt. Zion Church of Christ and the Ladies Guild of the church. Survivors include three sons, Henry Vogtman, at home, and Howard and Clyde Vogtman, both of Detroit; a sister, Mrs. Mary Gibson, Mt. Savage, and three grandchildren. The body is at the Hafer Funeral Home. The family will receive friends at the funeral home from 2 until 4 and 7 to 9 p.1 m. today. Services will be conducted tomorrow at 2 p. m. at the funeral home by Rev. Dr. Paul V. Taylor, pastor of Zion Church of Christ. Burial will be in Frostburg Lutheran Cemetery. FROSTBURG- C. Aden Vogtman, 68, of 31 Grant Street, died yesterday evening in Memorial Hospital, Cumberland, where he had been a patient seven weeks. He had been in ill health six months. A native of Frostburg, he was a son of the late William and Elizabeth (Wagner) Vogtman. Mr. Vogtman had been employed as a barber for 40 years. Surviving are his widow, Clara (Lammert) Vogtman; a son, William R. Vogtman, Frostburg; a sister, Mrs. William Biddington, Silver Spring; and two grandchildren. The body is at the Durst Funeral Home where the family will receive friends today from 7 to 9 p. m. and tomorrow from 2 to 4 p. m. and 7 to 9 p. m. Services will be conducted at the funeral home Wednesday at 1:30 p.m. by Rev. Wayne Miller. Interment will be in the German Lutheran Cemetery, Frostburg. CUMBERLAND — FROSTBURG — Clara Mae Vogtman, 93, of Frostburg, passed away on Monday, May 27, 2013, at the Frostburg Village Nursing Home. Born Sept. 3, 1919, in Frostburg, she was the daughter of the late Phillip Thomas and Etta (Snyder) Thomas. She was also preceded in death by her husband, William R. Vogtman Sr. and a grandson, William Vogtman III. She worked as a bank teller at the Fidelity Bank. She was a member of the First Congregational Church where she was a Sunday School Teacher, a member of the Ladies Aid, and a member of the choir. Clara was a homemaker and sang with the September Singers. She is survived by two sons, William Vogtman and wife Janice, of Frostburg and Thomas Vogtman and wife Frances, of Frostburg; grandchildren, Todd Vogtman, Thomas Vogtman Jr. and Teresa Norris; great-grandchildren, Zackary Vogtman, Reese Vogtman, Quinn Vogtman, Cory Vogtman, Shenna Vogtman, Marshall Vogtman, Kyle Vogtman, Karl Vogtman and Colin Vogtman and sister, Phyllis Rosley and husband Raymond, of Baltimore. Friends will be received at the Sowers Funeral Home on Thursday, May 30, 2013, from 2 to 4 and 7 to 9 p.m. Funeral services will be conducted in the First Congregational Church, Bowery Street, Frostburg, on Friday at 1 p.m. with the Rev. Ken N. Hamilton officiating. The family will receive friends from noon until the time of the funeral. Pallbearers will be Jack Folk, Todd Vogtman, Ben Norris, Thomas Vogtman Jr., Zackary Vogtman and Norm Snyder. Interment will be in Frostburg Memorial Park. FROSTBURG - Clyde Gibson Vogtman, a local businessman and native of Allegany County, died October 1, 2003, in Asheville, North Carolina. Born January 8, 1909 in Frostburg, he was the son of the late Christian and Annie (Morgan) Vogtman. He was also preceded in death by two brothers, Howard and Henry Vogtman. Mr. Vogtman graduated from Beall High School. He continued his education in Philadelphia, PA, graduating from Temple University in 1933. He served in the Army from 1942-1944. He married Marian Jean Gocschel in 1947. He was active, with his wife, in a number of businesses around the Detroit, Michigan area. In 1959 they founded the Continental Motel, Inc. He remained active in business until 1982, when the couple retired to Palm Beach Gardens, Florida. Mr. Vogtman was always remembered for his hard work and devotion to his family. He was an active member of the Zion United Church of Christ in Frostburg. Surviving in addition to his wife, are two daughters: Karen Vogtman King and her husband, Robert, Frostburg, Carol Vogtman Gerson and her husband, Allan, Palm Beach Gardens, Florida; three grandsons: Robert H. King, II, Michael Gibson King, and Mark W. King. A service will be conducted at the Sowers Funeral Home, P.A., 60 W. Main St. Frostburg, on Saturday, October 4, 2003 at 11:00 a.m. with The Rev. Diane Smith officiating, after which interment will be at Frostburg Memorial Park. Conrad Vogtman, 22 years old, son of Prof George Vogtman, director of the Arion Band, died Monday afternoon at Miner's Hospital from pneumonia and erysipelas. Besides his father, he is survived by his wife, who was Miss Frances Rafferty and the following brothers and sisters: Mrs Henry Hager, Mrs Harvey Metger of Ridgeley, Emery Vogtman and Melvin Vogtman, Washington, D.C., and George Vogtman, Jr. Mr Vogtman was employed by the Cumberland and Westernport Electric Railway Company as a utility man and resided at Clarysville. The funeral of Conrad Vogtman who died Monday afternoon at the Miners' Hospital will be held tomorrow morning from St Michael's Catholic Church. A special car will bring the funeral party from the home in Clarysville to Frostburg to the church. Emory Daniel Vogtman, 51, former Kelly-Springfield Tire Company worker, died last night at his home, 55 Knobley Street, Ridgeley, after an illness of seven months. Born in Frostburg, Mr. Vogtman was a son of the late George and Catherine (Brode) Vogtman. His father was leader of the Frostburg Arion Band for 48 years. He belonged to Salem Evangelical Church, Frostburg, and the Ridgeley Volunteer Fire Department. Surviving are his widow, Mrs. Eleanor (Dean) Vogtman; one niece, Virginia Lee Beck, who made her home with him; two brothers, Melvin Vogtman, St. Louis, and George Vogtman, Trinidad, British West Indies, and a sister, Mrs. Stella V. Hager, Akron, Ohio. Last rites will be conducted Saturday at 2 p. m. at the Hafer Funeral Home here by Rev. Frederick D. Oborkircher, pastor of Zion Evangelical and Reformed Church. Burial will be in Allegany Cemetery, Frostburg. Although not living his alloted three score and ten, George Vogtman, at 69 years, one year short of his span, passed away peacefully and quietly at the call, toiling, working for sustenance in the very last moments. Prostrate from the heat of the pit in which he worked, he died. By industry he thrived and died, but not in vain. His life was one of worth. He was all a husband and father could be. He aided in rearing a large family. He was a community worker. He was a musician and his ability in that respect has meant the carrying on of Frostburg's grandest old musical organization, the Arion Band. His efforts will be monuments to his life in Frostburg. He was a devout, lovable, genial person and his passing marks another of Frostburg's good citizens who will be numbered among the missing but not forgotten. Frostburg, Md., July 30 — The funeral of George Vogtman, aged 68 years, who expired following a heat prostration at the Kelly-Springfield plant, Cumberland, early yesterday morning, will be held from the family home at 133 West Union street, Friday morning at 10 o'clock. Rev. John W. Keener, pastor of the Salem Reformed church will officiate. Members of the Arion Band of which he was a director for the past 44 years will serve as pallbearers and flowerbearers. Burial will be in Allegany cemetery. Died - After a week's illness of erysipelas at the family home, Frost avenue, Monday afternoon, June 30, 1913, Mrs. Katharine Vogtman, wife of Prof. George Vogtman. Mrs. Vogtman was born at Borden Shaft in 1865, and had she lived until July 16th would have been 48 years old. Husband, two daughters and four sons are bereaved, Estella of this place, and Mrs. Harvey Metzger, of Cumberland; Messrs. Emory, Conrad, Melvin and George Vogtman, Jr., of this place. She leaves also seven sisters and four brothers, Miss Mary Brode, Mrs. Justus Youngerman, Mrs. George Mayer, Mrs. Henry Lehr, Mrs. Charles Michael, Mrs. George Lehr and Mrs. Jas. Close, and Messrs. Conrad Brode, of this place; Henry Brode, of Seattle, Washington; Charles Brode, of Sharon, Pa., and Philip Brode, of Belair, Ohio. Mrs. Vogtman was a member of the Order of Rebekah, local lodge, and a communicant of Salem Reformed Church, who took for many years an active part in all departments of church promotion. A good wife and mother, also; her memory is blessed alike in church and home. Funeral probably Thursday afternoon. Marcus W. Volk, 79, of 5 North Woodlawn Avenue, LaVale, died today in Sacred Heart Hospital where he was admitted Saturday. Born in Chanute, Kansas, he was the son of the late Mrs. Grace A. Volk. He was a retired Gulf Oil Corporation emmploye, a member of Duke Memorial Bible Class, LaVale Volunteer Fire Department and the POS of A of Ellerslie. Surviving are his widow, Mrs. Edna (Wiley) Volk, ....daughters, Mrs. Norman E. Tichnell, this city, and Mrs. Mildred Caufield, Arlington, Va.; one son, Marcus W. Volk, Jr., Greenbelt; two sisters, Mrs. George W. Brown, LaVale, and Miss Mary B. Volk, Cumberland; one brother, Harry P. Volk, Baltimore; three granchildren and two great-granchildren. The body is at the Kight Funeral Home where friends will be received tomorrow from 2 to 4 and 7 to 9 p.m. Services will be conducted at the funeral home Wednesday at 3 p.m. by Rev. John F. Sammel. Interment will be in Rose Hill Cemetery. Mrs. Anna B. Von Moose, 79, formerly of Somerset, died in the Allegheny Lutheran Home at Johnstown on Sunday, Sept. 16, 1962. She was born at Saxton, Pa., on Nov. 3, 1882, and was a daughter of the late Alvay and Louise (Streng) Murray. She was preceded in death by her husband, Harry A. Von Moose. She is survived by one daughter and one son, Mrs. Charles Sandosky of Somerset and Albert Von Moose of RD 3, Somerset; and a brother Howard A. Murray of Johnstown. Mrs. Von Moose was a member of the Trinity Lutheran Church of Somerset; the Ladies' Auxiliary of Baltimore and Ohio Railroad Trainmen and the Daughters of America. MT. STORM, July 2, 1913 - It was quite a shock to the people of this community when the news was heralded over the phone that Mr. E. G. Vossler was dead. For a number of years he was engaged in the mercantile business here. He was always noted for his sterling honesty and integrity. Careful in business, he seldom made a mistake, and when he did he was always glad to correct it when pointed out. We extend our sympathy to the bereaved ones. ROCKWOOD, Sept. 11 — Mrs. Bertha Briskey Vought, 50, died Tuesday morning at her home in Milford township, near here, after an illness of several weeks. Surviving are her mother, Mrs. Clara Stevanus of Salisbury; her husband, William W. Vought, and these daughters: Marguerite, wife of Nathan Emert, of Somerset, and Mabel, wife of Earl Miller, and Helen, wife of Otto Snyder, both of Wilkinsburg. Deceased was a sister of Mrs. Ben Sheeler and Mrs. Miles Lohr of Garrett, Mrs. Milo Ringler of Berlin, Mrs. O. R. Lansberry of Somerset, Mrs. Lloyd Younkins and Norbert Briskey of Springs and Alton Briskey of Meyersdale. The funeral service will be held at 10 o'clock Friday morning at the home in charge of Rev. L. W. Gross of the New Centerville Lutheran Church. Burial will be made in Somerset County Memorial park. Meyersdale - Mrs. Mary A. Vought, 64, wife of Lloyd C. Vought, died Monday at her home, RD 1, Garrett. She had been ill six months. A lifelong resident of Garrett, she was a daughter of the late George and Sarah (Cross) Growall. Surviving in addition to her husband are a son, George B. Vought, RD 1 Garrett; three daughters, Miss Elizabeth Vought, at home; Mrs. Cecil Petenbrink, Meyersdale; and Mrs. Wilmer Marker, Jr., RD 1, Garrett; a brother, William Growall, Detroit; and a sister, Mrs. D. C. Sanner, Tucson, Ariz. Funeral services will be conducted tomorrow at 1:30 p. m. at Zion Lutheran Church by Rev. Charles Staub, pastor, assisted by Rev. E. L. Definbaugh, pastor of Amity Reformed Church. Burial will be in Union Cemetery. The body is at the residence. MEYERSDALE, Feb 6—Mrs. Susan Haer Vought, 88, widow of John V. Vought, died Sunday at the home of her son Lloyd at Garrett, R D. There are two sons, 10 grandchildren and 11 great-grandchildren. The funeral will be held Wednesday afternoon.